Nostalgia (noun): a wistful desire to return in thought or in fact to a former time in one's life, to one's home or homeland, or to one's family and friends; a sentimental yearning for the happiness of a former place or time. I will start off this thread with a very long read from "The Vault" of Sports Illustrated. It is about Bob Feller. My guess is that many readers of this board are too young to even recognize that name. Other "old timers" around here are encouraged to add links and stories to this thread, if you so desire. Bob Feller was born in 1918, the same year that my father was born. 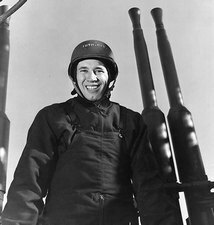 Bob Feller died in 2010, at the age of 92. That is a wonderful photo. The Heater from Van Meter .. Bullet Bob .. Rapid Robert. Great nicknames for one of the first major league players to enlist immediately after Pearl Harbor. Mickey Mantle .. Why an Oklahoma kid like me was a Yankees fan. The following link is to a short piece that details the home run that hit Frank Gifford’s foot on the USC football practice field. Last edited by SoonerTraveler; 10-19-2016 at 11:50 AM. When you'd leave the Lloyd Noble Center in the 80s, the last tune you'd hear from the pep band was not the OU Chant. Nope, it was THIS sweet little ditty called "Boomer Blues". The Pride played this during a football game a couple of years ago at halftime for Homecoming. I hadn't heard it since I was a little kid and, to be honest, I teared up. Thank goodness I was wearing sunglasses. Thanks for posting the link to "Boomer Blues" as that does bring back fond memories. Classic OU basketball memories. I hope the OU band plays more and the "microphone dude" talks less during the time-out periods at the games this season.